The Myth of the Starship. “MOSCOW, November 30 (RIA Novosti) – A launch of a Zenit carrier rocket with a U.S. telecommunications satellite originally scheduled for Sunday midnight has been delayed for technical reasons, a spokesman for Russia’s space agency Roscosmos said”. From RIA Novosti. From our neighbor down south, the Arizona Daily Star in Tucson has another report on Jupiter’s moon Europa, and the likelihood of finding life thereupon. Butterflies in Orbit. The butterfly habitat will be transferred to the Space Station within the first 2-3 days of the STS – 129 mission. “About 100 elementary and middle school classrooms across the U.S. are participating in a pilot study by setting up ground-based habitats. Students will replicate the space experiment and compare the growth and behavior of their butterfly larvae with those living in the microgravity environment of space,” said Dr. Greg Vogt, senior project manager at Baylor College of Medicine’s (BCM) Center for Educational Outreach. The European Space Agency (ESA) has released beautiful spectra from the Herschel spacecraft situated at SEL-2. Detailed analyses of these spectra provide insight into the physical and chemical composition of the objects. For example, see the results of the SPIRE spectrum of Canis Majoris. Herschel covers the full far infrared and submillimetre waveband. The Space Shuttle Atlantis returned safely, arriving at Kennedy Space Center at 9:44 AM EST this morning. Xinhua news agency reported that China plans to launch its second Moon probe in October of 2010. An update on the “Hole-in-the-Moon” discovered by the Japanese spacecraft Kaguya and the associated lava tube. A ready to use Moon Base? Dark Matter may power your journey to the stars. The Space Shuttle Atlantis has undocked from the International Space Station and is scheduled to return to Earth on Friday, 27 November 2009. A long, but fascinating, article about how we may have acquired many of the stars in our Zodiac in a giant, violent event 30 Million years ago. A beautiful image of the Crab Nebula, which exploded in 1054 AD. This is a composite image from the Chandra X-Ray orbital telescope, the Hubble telescope in visible light and the Spitzer Space Telescope in the infrared. 40 minutes from now (10:50 PM Phoenix time) you can get the latest updates on the Atlas 5 launch of the Intelsat 14 at the Forum at NASASpaceFlight.com. If you miss the live launch, get the details at the Intelsat 14 link. The New Scientist reports that a dark matter galaxy may be crashing through the Milky Way. Astronauts visiting the International Space Station aboard STS-129 have completed their second space walk. In other places, the Large Hadron Collider in Cern, Switzerland is making progress. Cassini makes its eighth flyby of Enceladus where the Composite Infrared Spectrograph (CIRS) instrument will make a map of thermal emissions from the tiger stripe at Baghdad Sulcus. The Astronaut Hall of Fame in Titusville, Florida was the sight of NASA’s Astronaut Glove Centennial Challenge contest yesterday. Peter Homer of Southwest Harbor, Maine, won $250,000 for his glove, and Ted Southern of Brooklyn, New York won $100,000. Congratulations. Gabrielle Giffords of Arizona and Pete Olson of Texas have dug in their heels and reiterated their backing of the doomed Constellation program. Even though Ares I is underpowered and technically challenged and Ares V is over weight and too costly to fly, both want to throw more money at it and hope for the best: “The United States needs to make clear to the rest of the world that we are not wavering” said Giffords. But costs will ultimately undo Constellation. Ares I has cost $8 Billion so far, and will ultimately cost four (4) times what human rating of commercial vehicles will cost, yielding a rocket with less capability than commercial vehicles. Apparently, the politicians are all-in to protect their constituents jobs and funding, but will likely lose the bet. 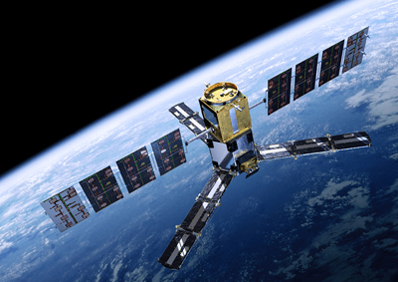 The MIRAS instrument on ESA’s SMOS satellite, launched earlier this month (2 November – below), has been switched on and is operating normally. Mountain formation on the Moon, as seen by LROC. Life is busy on the International Space Station with thirteen cosmonauts and astronauts and whatnoughts. The first spacewalk of the mission began at 7:24 AM Phoenix time and will work on a number of maintenance tasks outside the International Space Station. Mike Foreman and Robert Satcher will install a spare communications antenna, route cables, and lubricate parts of the mobile base system and Kibo robotic arm. NASA’s Wide-field Infrared Survey Explorer, or WISE, is scheduled to roll to the pad on Friday, Nov. 20, its last stop before launching into space to survey the entire sky in infrared light, sometime on or after 9 December 2009. The Wide Field and Planetary Camera 2 that spent 15 years taking amazing pictures on board the Hubble has been returned to Earth and will take up residence in the Smithsonian’s National Air and Space Museum in Washington. Pratt & Whitney Rocketdyne has successfully tested a thruster for an unmanned lunar lander. The crew of Atlantis has begun inspecting their spacecraft for signs of damage following Tuesday’s successful launch. Check in on the crew of STS-129. Good Leonid shower this morning, even in Phoenix (4:30 AM). In 15 minutes we saw 10 streaks, including one blue-green and a very bright white trail that left glowing debris for 5-10 seconds. But nothing compared to this one. As pretty as meteor showers are from Earth, they can be deadly for satellites. Ouch! Time magazine has named the Ares I “The Invention of the Year”. Unfortunately for Time, there was no Ares I rocket launch this year. There was a space shuttle solid rocket booster with a lot of dummy components on top painted to look like an Ares I that was shot off last 28 October. Buzz Aldrin wrote a scathing review recently concerning the Ares program, labeling the $450 million launch a political stunt. The Space Shuttle Atlantis is scheduled to liftoff this afternoon at 12:28 Phoenix time. This mission is dedicated to taking up the spare parts of the highest priority to the ISS. The Leonid meteor shower is set to peak Tuesday night. A well placed observer in Asia or Eastern Europe should see hundreds of meteors per hour. North Americans should see the shower just before dawn on Tuesday. Fall colors in the Eastern United States, as seen from the Terra (EOS AM) and Aqua (EOS PM) satellites using the MODIS (or Moderate Resolution Imaging Spectroradiometer) instrument. Terra’s orbit around the Earth is timed so that it passes from north to south across the equator in the morning, while Aqua passes south to north over the equator in the afternoon. The Mars rover Spirit is stuck in a sand trap and may be doomed to remain there. The New Scientist has a review of the plucky life of Spirit. The launch of the Atlas V carrying the Intelsat 14 communications satellite was scrubbed after a technical issue with its ORCA (Ordnance Remote Control Assembly). Rosetta completed its third and last fly-by and is headed toward the outer Solar System and its rendezvous with comet 67P/Churyumov-Gerasimenko. The Progress vehicle is scheduled to deliver the Russian Poisk module to the International Space Station today. Docking is scheduled for 10:44 EST. Rosetta catches a glimpse of the Moon as she approaches the Earth for a gravity assisted fly-by (tomorrow) toward the cometary belt in 2014. Armistice Day (for those of us who remember it). Veterans Day for all of us. A salute to all those who serve. Is Einstein’s theory of relativity wrong? Two spacecraft (Galileo and Rosetta) gained more speed on their past fly-bys of Earth than predicted. The next Rosetta fly-by on 13 November 2009 will be another test. A 1.1 millimeter per second of excess velocity has been predicted. A Soyuz rocket with the Poisk module for the International Space Station was successfully launched this morning. Docking is scheduled for Thursday at 10:44 EST. Two missions are shaping up to explore the moons of Jupiter. See the discussion in this article in The New Scientist. A Soyuz rocket with the Poisk module for the International Space Station was erected Sunday for launch tomorrow at 9:22 EST (7:22 Phoenix). Docking is scheduled for Thursday at 10:44 EST. Emily Lakdawalla of The Planetary Society will conduct two live classes in Space Image Processing: I. Images Are Data, tentatively scheduled for Friday, November 13, 2009 at 10:30 Pacific (18:30 UTC) and II. Getting Started with Space Image Data: Rover and Cassini Raw Images, tentatively scheduled for Thursday, November 19, 2009 at 10:30 Pacific (18:30 UTC). Reservations are limited, but the classes will be recorded and available for download. Geyser plumes on Enceladus, indicators of life or just a hot radiation environment? See JPL’s comments. Continuing worries over the electronic glitches that Mars Reconnaissance Orbiter has experienced. Updates to the computer, flash memory and programs. The latest issue of NASA SPINOFF is now available online. LazerMotive won $900,000 in the Space Elevator Games. Congratulations. A kilometer climb in under 4 minutes (3.9 km/second). Russia is shipping two Soyuz rockets to Kourou (home of Arianespace) in French Guiana, South America. LROC images landslides in Marius crater. Wayne Hale comments on those who know “the price of everything and the value of nothing”. Atlantis’ cargo, consisting of Express Logistics Carrier 1 and 2, holding about 28,000 pounds of supplies and spare parts for the International Space Station, are being loaded into the cargo bay, prior to the 16 November launch. These are critical parts. Fast romp up the Space Elevator. Who says commercial launch vehicles are not human rated? NRO thinks several $Billion (with a $B) worth of satellites are safe with commercial ULA vehicles. 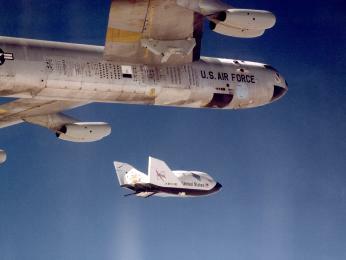 Gotta love a B-52 launching the X-38 lifting body. Check the mission decorations on the fuselage of the B-52. The Mars Phoenix Lander has been imaged by HiRise in two images following the return of the Sun to the northern polar region of Mars – “July 30, 2009, (left image) and in Aug. 22, 2009 (right)”. Iron and Titanium on Mercury – the BBC reports on some of the results from the recent fly-by of Mercury by MESSENGER. Astronomers have tracked down a gigantic, previously unknown assembly of galaxies. The filament is located about 6.7 billion light-years away from us and extends over at least 60 million light-years. You Tube has an aerial view of the Ares I-X flight. The John Hopkins University Applied Physics Laboratory will conduct a conference today at 1 PM EDT on the recent MESSENGER flyby of Mercury. The press kit is available here. Dark Matter Stars in the earliest universe? Super Black Holes? NASA’s Cassini spacecraft made its deepest plunge yet into the plumes of Saturn’s moon Enceladus on Monday. The dive might reveal complex organic molecules that could hint at life. We Have A Winnah!! Masten Space Systems has officially won the Lunar Lander Challenge. The National Space Society “Ad Astra” program helped engineer Jorge Rivera prevail with the “Beanie Cap,” which prevents ice from forming on the Space Shuttle External Tank LOX vent, avoiding harm during launch. The tool came about because of his enthusiasm. The Soil Moisture and Ocean Salinity, or SMOS, satellite was successfully launched early today aboard a Rockot launcher. The Rockot, made of retired ballistic missile parts, took off from Complex 133 at the Plesetsk Cosmodrome about 500 miles north of Moscow. “Does the Final Frontier Have a Future? Debating America’s Next Steps in Human Space Flight,” will be the topic being hosted today by the American Institute of Aeronautics and Astronautics (AIAA). The discussion is free and open to the public, and takes place on Monday, November 2, at 1:00 p.m. in Room 106, Dirksen Senate Office Building, Constitution Ave. and 1st St. NE, Washington, D.C. Details. The JAXA HTV-1 has de-orbited and burned up in the atmosphere after a successful 52 day stay. The Japanese Cargo Supply spacecraft HTV-1 undocked from the International Space Station and is scheduled to de-orbit and burn up in the atmosphere tomorrow with a load of trash. The Soyuz TMA-17 was delivered by rail to Baikonur Cosmodrome for prelaunch processing. TMA-17 will launch the Expedition ISS-22/23 crew to the International Space Station. A large collection of photographs are at the link.